Put down the newspaper, Grandma! There's a newer, more exciting, more challenging crossword available. 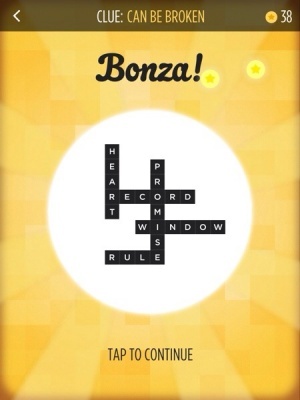 Bonza Word Puzzle claims to be a crossword puzzle with a difference, and it stays true to its word. 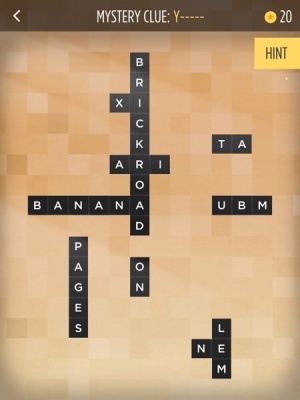 It effectively turns the crossword puzzle on its head, giving players the answers first and a common category second. Players must then go about composing a complete crossword from separated parts, whereby they must place the fragments near their companions by sliding them together. They will then click into place, and be movable as one. If a part is in the wrong place, the game will let players know by leaving a tiny gap in between the tiles. For some added perspective or just to create some extra space, players can also zoom out using a quick pinch of the screen. It's a puzzle mechanic that's infectious and fun, while posing a challenge the deeper players progress. If they do get stuck they can either use the clue at the top of the screen as a guide, or spend some star coins on a costly reveal hint to help things along. Sometimes a hint might even be needed to get things going, since on multiple occasions I literally had no idea where to start, particularly as the clue was fairly cryptic in nature. A greater coin reward, cheaper hints or more types of (cheaper) hint options would all prevent the dreaded standstill that no-one wants in a puzzle game. With 3 free puzzle packs and a free daily puzzle to contend with, there is more than enough for players to get sucked into before they'll have to part with their cash for more content. While some may tire of the linear and repetitive gameplay, I never found it to be too repetitive thanks mostly to the slick presentation and ambient sounds that carry the gameplay along nicely enough that one can lose pockets of time to it. 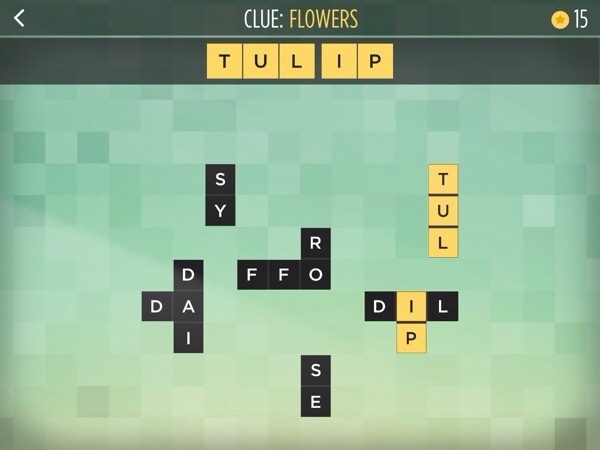 Bonza Word Puzzle is inventive, unique, and very rewarding, even if it can be slightly merciless in its hint and mystery clue systems. For anyone who loves a good word puzzle, definitely give Bonza a try.